On Monday, I watched 11 Democrats demonstrate the rights government workers deserve—while voting against granting them. Let me back up. Monday morning, the House Labor and Industry Committee met at the Capitol to discuss the rights of our state government workers. One of the bills on the agenda was Rep. Kate Klunk’s HB 2571, which ratifies the Supreme Court’s Janus decision as state law in Pennsylvania, while also instructing public employers to notify nonunion workers that union payments are voluntary, and to inform new employees that paying a union is not a condition of their employment. CF has endorsed this bill from the start because government employees deserve to know their rights. You won’t believe what happened later. All 11 Democrats stood up and walked out of the committee meeting. These members all voted against giving workers transparency about their right to join or resign from a union. The irony is that government workers should be able to do exactly what the 11 Democrats on the committee did Monday morning: leave if they feel their voices aren’t heard. I’m happy to tell you that despite the theatrics, the bill has now advanced to the floor for a vote. 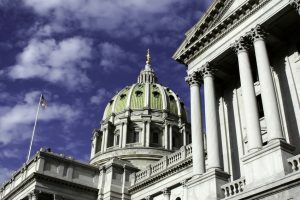 We are hopeful the full House and Senate will put the bill on Governor Wolf’s desk this fall. Despite the big-money influence that unions clearly exert on lawmakers, CF is winning policy victories that bring fairness and individual liberty back to the public sector workplace. P.S. Here’s a picture of the meeting after the walkout.